Last weekend’s Super Smash Bros. 4 tournament, one of the most anticipated yet, was a wrestling-style rivalry match between two crews led by two Smash titans. 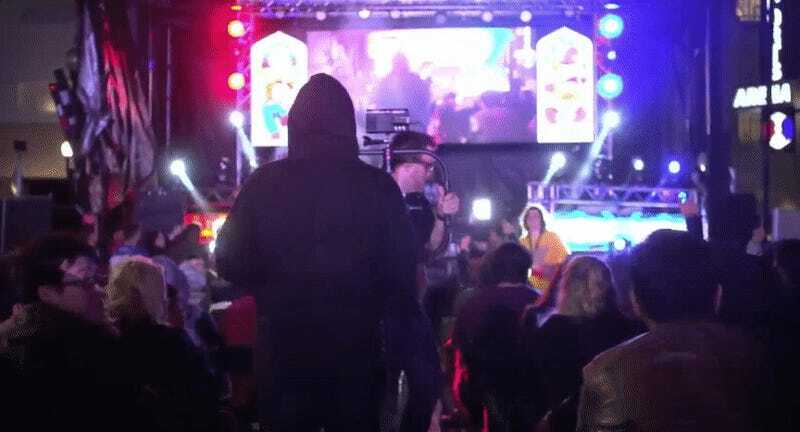 Drawing over 50,000 viewers, Civil War was a DIY event from the ground up. It’s the kind of event that could only exist around a gaming community left to its own devices, with essentially no meddling from developers or publishers. Civil War was born of a tweet last year by a top Fox player named Larry “LarryLurr” Holland. He asked, “If there was a civil war in Smash 4 with ZeRo and Ally leading the opposing sides who do you think each top player would side with?” Below the tweet, the community heatedly debated which “Smash god” they were faithful to. Fan-made trailers, fan-made overlays and fan-made posters all contributed to the hype, which attracted players to the Santa Ana, California, event from as far away as Japan. It caught on because of “plot”: the ongoing narrative Smash fans weave out of top players’ wins and losses against each other. Gonzalo “ZeRo” Barrios is widely considered the best Smash player around, but Elliot “Ally” Carroza-Oyarce has some ineffable power over him, stealing some unexpected wins throughout the years. Carroza-Oyarce’s surprising victories against Barrios spawned a “rivalry”—not a real one, Carroza-Oyarce insists—that led Smash promoter 2GGaming and California venue Esports Arena to join forces, making that rivalry the theme of a tournament. Nearly all the top players were there: Mk Leo, Nairo, Dabuz, ANTi, and others. After getting split by allegiance, they formed crews, or teams spearheaded by either rival. The community latched on, spamming #TeamZeRo and #TeamAlly across the web all weekend. Unlike publishers like Blizzard and Riot, Smash’s developers or publishers do very little to cultivate or promote competitive scene. In fact, it’d be a mistake to ascribe any ownership to them. The culture belongs to the players, one-hundred percent, and that’s what what makes it fertile for grassroots events like Civil War. Smash’s competitive scene is sometimes considered the black sheep of Nintendo’s esports-leaning franchises. Pokemon and Splatoon tournaments are both hosted by Nintendo, but for the most part, high-stakes competition runs against the publisher’s brand, which is built on easy-access fun. Prior to Smash 4’s 2014 release, Nintendo briefly paraded it at an invitational tournament at E3. But while Nintendo has sponsored events like Apex 2015, it rarely hosts them in the U.S. A little more relaxed, Nintendo runs Amiibo-only Smash tournaments in Japan, each limited to 16 players. The prize was a free Amiibo figurine. Compared to the U.S.’s fiercely competent Smash tournaments, which attract players from around the world, Nintendo promotes a scene with more entry points than skill. In an interview with Nintendo Life, Super Smash Bros. creator Masahiro Sakurai explained that he designs the franchise so each game “can also be enjoyed by a wide range of people, such as those who might just be getting into gaming when they are released.” He stressed that, to do this, he can’t listen “just to the biggest fans, but to a whole range of different users to give everyone an experience that is fun.” Throughout the years, he’s made a few offhand comments in favor of casual play, implying that competitive play can polarize the community. To him, it seems, the competitive community doesn’t reflect the populist brand Nintendo stakes its success on. Given Nintendo’s lack of support, the Smash 4 scene belongs to the players, and this is why events like Civil War are able to exist and thrive. “We created our own forums, chat rooms, strategy guides, tier lists, tournaments, everything,” Smash 4 player Stephen “Omni” Silver told me. He thinks that the scene would be less “raw” if Nintendo had more of a hand in things. “There’d be less interaction between members of the community because, instead of building our own foundation, we’d simply stand on Nintendo’s coattails [sic],” he explained. With Civil War, players were empowered to create their own rivalry narrative, in part, because they owned the means of communicating about the game. They made the memes; they tweeted out fan art. There was no giant publisher swooping in with buzz-killing dad jokes about top players. There was no insane ticket price inflated by publisher-run tournaments. It’s by the fans and for the fans. In an e-mail, 2GGaming tournament organizer James “Jmex” Chacon described all the art, fan overlays, trailers and final renders the community put together to brand Civil War. Nintendo’s hands-off approach to Smash’s competitive scene means anyone can contribute to it, he says. The Smash community’s culture runs pretty deep—rivalries, friendships, “plot armor”—players who win because they have good stories—memes, upsets and the Wombo Combo. “Hype” is one of the most-used words for describing Smash’s competitive scene. It’s an organic sort of hype, built from the ground up, that grew strong as the game’s grassroots culture strengthened. It’s like constructing a kids-only treehouse that your parents have never entered. With that said, no kid ever turned up their nose at a $20 slid under the door. [Correction—4:30 PM]: The article previously stated that Nintendo hosted a Smash 4 invitational at E3 after the game’s release. The event was in fact prior to Smash 4's release. We regret the error.